Songs, Skits, and the Search for St. Nick! 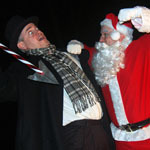 Twist-a-Carol is a holiday extravaganza featuring skits and songs that put a twist on the usual holiday fare. Join us as we celebrate of the highs and lows of this very special season. Featuring an all-new line-up of original plays including the world premiere of Moby-Nick...a tale of obsession, angst, and shopping malls on Christmas Eve. The Perfect Christmas: What are you willing to do for the perfect holiday? The Great Christmas Conspiracy: Kids say the darnedest things. Carol of the Drum: How silent was it that night? The List: It's more than a question of naughty and nice. Anna Claus: The story behind the legend. PLUS...songs to revive your holiday spirit! ALL NEW SHOW!!! ONE WEEKEND ONLY! With ticket prices being so low, no further discounts will be offered. Plus: $1 from every ticket sold and all proceeds from concessions will be donated to the Elgin Community Crisis Center. Twist-a-Carol is sponsored by the Elgin Cultural Arts Commission.